The x86 battle is heating up as AMD's EPYC enters the fray. AMD has made an epyc x86 comeback (pardon the pun) and the data center wars between the two chip manufacturers are quickly heating up. While gaming and consumer chips usually get most of the press time, it is the data center chips that drive a bulk of the revenue and can make the most difference whether an architecture succeeds or fails. I will keep my commentary to a bare minimum on this one and let the results do most of the talking. Background: The information contained in this article was provided by an Intel spokesperson and all all tests included can be independantly verified by using the same AWS instances and configurations. 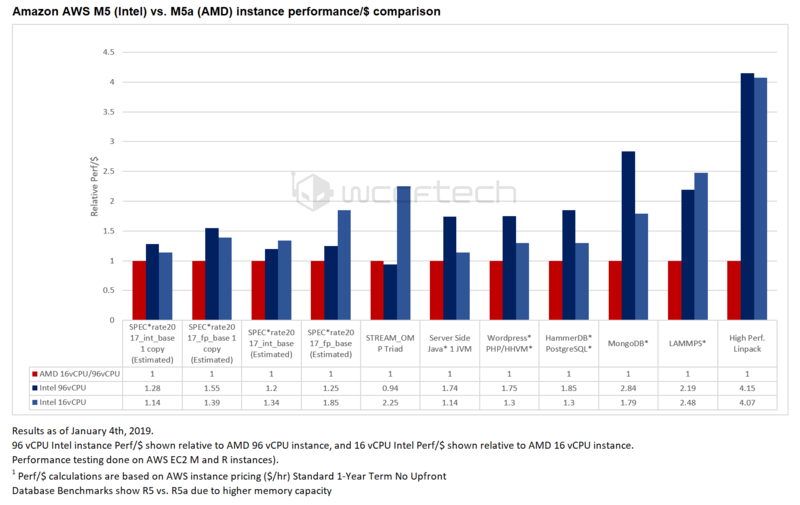 Amazon AWS EC2 introduced AMD EPYC based instances in November 2018. These instances are powered by EPYC processors and have the same number of virtual CPUs and memory capacity as the Intel instances. The instances can scale from 2 vCPUs all the way up to 96 vCPUs. Here’s the kicker though, on a generalized basis, AWS priced AMD instances are 10% cheaper than Intel instances. These instances were the M5 (Intel) and M5a (AMD) general purpose instances, R5 (Intel) and R5a (AMD) instances. Today we are going to be taking a look at a wide variety of use cases that for cloud infrastructure and do an apples to apples comparison of these instances (to the extent possible anyway). 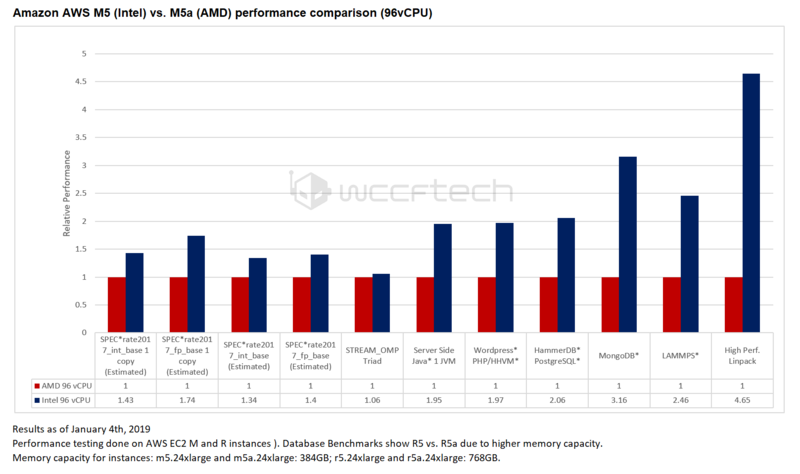 Keep in mind, however, that while we can be sure AMD instances are running on the EPYC architecture, Intel instances may not be (Amazon does not state the architecture) but since some of these tests require AVX 512 we can assume that they are the latest one. The first benchmark showdown is between the 16 vCPUs class of instances. The benchmark is running on Linux 7.5 using the ICC compiler. Intel instances have a small lead on web/java workloads as well as a massive lead in HPC. This is not particularly surprising considering the fact that EPYC has 2x 128-bit FMA while Skylake and above have 2x 512-bit FMA – which give them quite the edge in HPC tasks. I would like to mention two caveats here: some of these instances, like the server side ones, have not been NUMA-binded since that would require extensive tuning as well as the fact that using a different compiler (like GCC) could result in improved performance. That said, these are expensive optimization routes and while they would narrow the gap in the server-side data (other benchmarks like SPEC are already NUMA-binded) it will not be enough to beat the Intel counterparts. A similar picture emerges in the 96 vCPU instance where once again, the Intel counterpart dominates the AMD side of things. The HPC difference is once again apparent but the memory bandwidth has now been normalized. Finally, here is the performance per $ comparison using AWS pricing as of 12th January, 2019. Once again this is on a relative basis. On average, the Intel counterparts provide higher value from anywhere between 1.25x all the way up to 4.1x with HPC. What these tests are trying to say here is that the Intel instances offer both higher value and absolute performances across almost all cloud use cases. 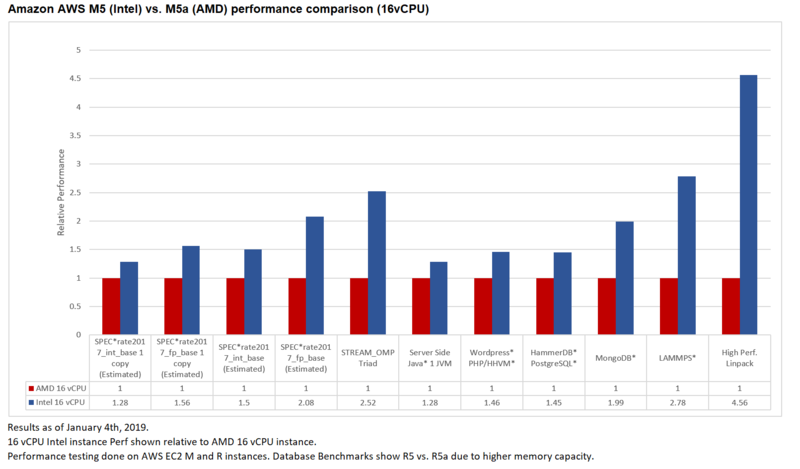 Once again, you could probably get the AMD numbers a bit higher up by using a different compiler and getting dedicated load optimizations in place (such as NUMA-binding) but the improvement should not be enough to overpower the underlying hardware differences (like MCM vs monolithic and the difference in FMAs which is very important for HPC). On the basis of these numbers it appears that Intel does still own the data center market – and that’s okay – because the professional/amateur/video market is one where EPYC can truly shine considering the cost of Intel counterparts.